Who Does Cindy Sherman Think She Is? "...we have here a canny aspiring insider's strategy, the quintessence of work consciously tailored to be written about, custom-built to serve the needs and desires of a specific generation of critics. Picasso once said, 'I don't want there to be three or four thousand possibilities of interpreting my canvas. I want there to be only one. . . . Otherwise a painting is just an old grab bag for everyone to reach into and pull out what himself has put in. I want my paintings to be able to defend themselves, to resist the invader, just as though there were razor blades on all the surfaces...' Well, no razor blades here. 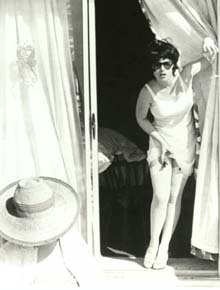 To the contrary, here's Cindy Sherman's message to those three or four thousand hungry opinionators: Lunch is served."